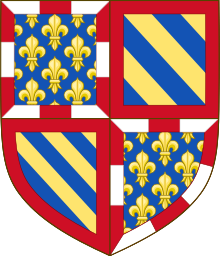 Bonne of Artois was Countess consort of Nevers by marriage to Philip II, Count of Nevers, and Duchess consort of Burgundy by marriage to Philip III, Duke of Burgundy. She served as regent of the County of Nevers during the minority of her son from 1415 until 1424. The County of Ferrette was a feudal jurisdiction in Alsace in the Middle Ages and the early modern period. It roughly corresponds with the Sundgau and comprised the lordships of Ferrette (Pfirt), Altkirch, Thann, Belfort, Rougemont and others. These territories were not contiguous, but formed a patchwork of jurisdictions under the Holy Roman Empire.